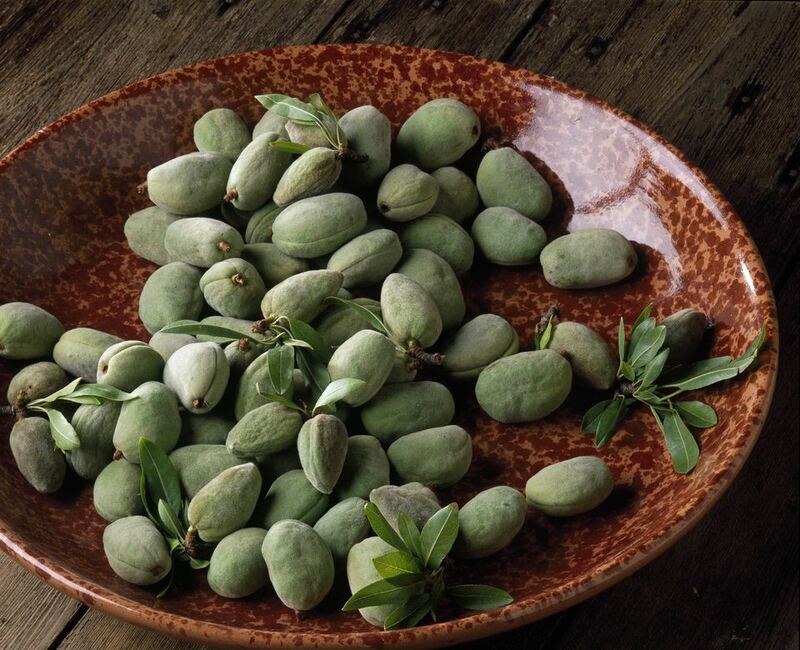 Green almonds are simply the immature fruits of the almond tree. The nut, or seed, is encased in a fuzzy green hull. When the almonds are so young that the seed inside is almost jelly-like, you can pickle them whole, hull and all. When they are slightly older but still lack any hard shell around the seed, you can pickle the kernel without the hull, as in this recipe. The result is a slightly tart and crunchy treat. Slice off just the tips of the pointy ends of the green almonds. Look for the seam that the hulls have along one side, similar to that of apricots or peaches. Run a paring knife along that seam. Split the hull apart along the slice, revealing the cream-colored, shell-less kernel within. Bring the water, vinegar, honey, and salt to a boil, stirring once or twice to completely dissolve the honey and salt. Meanwhile, load a clean glass jar (it is not necessary to sterilize the jars for this recipe) with the green almond kernels, tucking in the herbs and spices as you go. The herbs can be an attractive part of the presentation of your pickled green almonds, especially if you are planning to give them as a gift. Use a chopstick to tuck the dill or fennel sprigs and the chile pepper (if using) in between the sides of the jar and the green almonds so that they are visible. Once the vinegar brine has come to a full boil, skim off any foam that may have formed. Pour the hot brine over the green almonds, herbs, and spices in the jar. Make sure that the almonds are completely covered by the liquid. If you will be storing your green almonds as a refrigerator pickle, you can fill the jar all the way to the top. Pickled green almonds will keep for at least 2 months in the refrigerator. For longer term storage at room temperature, pack the ingredients into a pint-size canning jar (or 2 half-pint jars) leaving at least 1/2-inch headspace between the surface of the brine and the rim of the jar. Secure canning lid and process in a boiling water bath for 15 minutes (adjust the processing time if you live at a high altitude). Once canned, pickled green almonds will keep, unopened for years. But after you open a jar, they need to be stored in the refrigerator. Whether you make your green almonds as a refrigerator pickle or take the extra step of canning them, be sure to wait at least a week for the flavors to develop and mellow before sampling.